I'm still behind on visiting but I am part way through the letter I now! I will be by!!!!! WoW! I'm first to comment. My post this week: The Kindness Of Love. I'll be visiting your Ks soon. Have a great week/weekend everyone! I didn't quite realized that you visit every link, that must be lot of hard work. I keep thinking I should leave more comments but it's very hard to come up with a decent comment that doesn't make you sound like a broken record repeating other people's comments. but I really appreciate that you always came up with something nice. & thanks for hosting AT. Uh, so, o.k. What exactly happened to your link? I figure you are upset about all the extra work you are having to do because that jerk skipped out. Am I right???? Jenny, I love your "K" card. 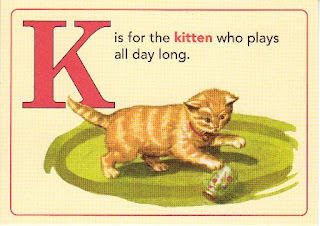 Kittens are a natural for this letter. Kitten play all day must be like blogging all day, huh? Still upset? I think you kicked the post! K-Day in Alpha Thurs land. Are you KIDDING me? Way too...KORNEY! But Happy K Day anyway! Kindly kick me a K, you kooky kid! hee hee...actually, nothing quite that fun or silly this week... maybe a little more on the spiritual side. Guess you'll just have to come see! Hope you're having a great week, Mrs. Jenny! It's been so long...I think I almost forgot how to do a blog post! Hope you are not thoroughly exhausted, my cosmic sister!! Be sure to come up for air occasionally!